Are you a lover of the kitchen? Do you like being the king of the grill? What about Jack the Ripper? Now you can own an item that meets your tastes, seemingly unrelated. What does the kitchen with the famous murderer? In principle, nothing. Or so we hope. 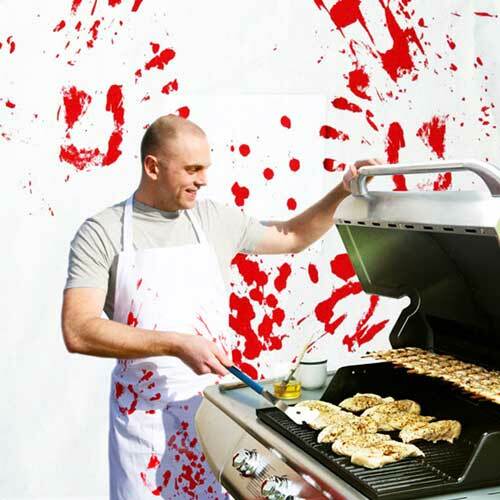 But the butcher's apron with bloody decor is the perfect complement to a day of barbecue with humor. Leading a barbecue requires knowledge and attitude. Find the pieces of meat right takes time. Then you need to control the weather and fire. And if you do not want to ruin our Sunday clothes, it is best to have an apron to prevent unwanted stains. This is where this original product. It comes factory stained imitating the color of blood. We're not inviting you to become a cannibal. If you saw the "Silence of the Lambs", you'll know where you end up: in solitary confinement, being visited occasionally by an FBI agent too intrusive. Perhaps the character played by Anthony Hopkins would have been good this apron, as one of his misdeeds just lost all blood after being charged with a pair of guards. And one can be a psychopathic murderer and cannibal, but this does not prevent soil our blood and avoid having the washer operation ... Neatness always foremost. Let's get back to reality. It is about Halloween night and prepared to find the scariest costume. You know that tonight, especially famous Anglo-Saxon countries, the custom is to wear an outfit that refers to death or the world of darkness. Witches, skeletons and others filled the night of 31 October. If you are looking to be original, think of this butcher's apron with blood stains. Its white color will appeal to everyone. Enough of skulls and witches right? Take a knife painted blood, preferably toy, and you've completed your costume. But this apron is not just for Halloween. If you are looking for an original gift and any friend you very fond of cooking, apron with blood stains not leave you indifferent. It may not be the best gift for Mother's Day, but for a chef with a great sense of humor.